in Savannah's room looked like when I purchased it. It wasn't horrible, but the upholstery was dingy and a dated crushed velvet. I saw it's potential though with it's great curves and petite size. I knew it would be great at the foot of her bed. After I hauled her home I began getting quotes for either slip covering it or getting it re-upholstered. 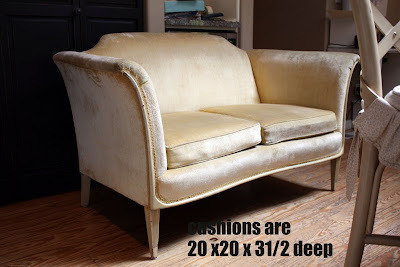 and re-upholstering it would cost about $450.00. Seeing as how it was only $25 to start with, that price wasn't horrible. But it also was not in my budget for my daughters room. Ikea that I found at the Goodwill. Normally this isn't something I would try and tackle on my own. But because of the large savings I thought it was worth a try. It actually wasn't too hard. and the money I saved was well worth it. I cut and stapled, and stapled and cut. 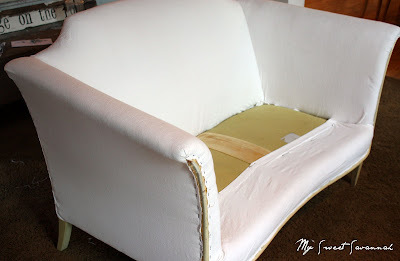 I covered the staples with white trim and fabric glue and painted the legs white. chocolate brown pillow to tie in the wall color. 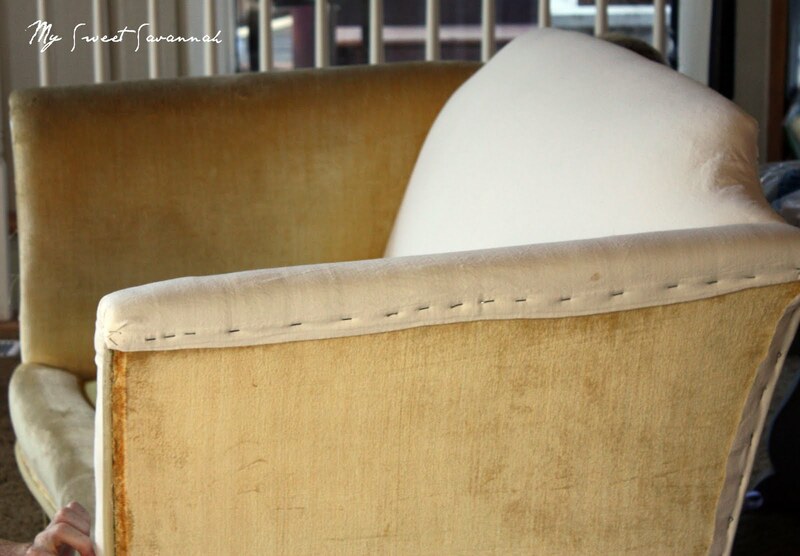 A pretty little French love seat for around $35. p.s. Emalee, Savannah says hi, and please tell your mom thanks for reading my blog! You should email Savannah, she'd love it! I love her room... so sweet .. you are a good Mom! Read your blog often and have borrowed many things from you and I thank you! Hugs! 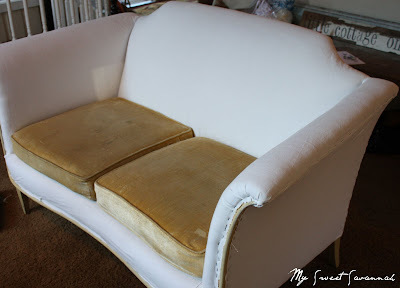 My goodness, you get the project done and you still have the energy to blog us about how you covered the loveseat---you are truly impressive. Thanks for the info.--the loveseat looks marvelous. What a beautiful job on a beautiful chair. What we moms won't do for our daughters. Love it. Pretty sure that is the best price for a beautiful loveseat there EVER was or will be, your are incredible! I think you did an amazing job! Don't you love when you do it yourself and save all of that money?! That's my kind of project. After reading a number of blogs from your area I have decided that your Goodwill stores should be renamed "Greatwill". One of the bloggers bought a chair for $1.29!!! Not finding those deals in Oklahoma..
Wow! I would never have been able to tackle such a job! It turned out very well. Super cute!!! I love the sofa. You are one talented lady. I wish I was that brave!!! Just ten minutes ago ifinished reupholstering a Begere chair out of target curtains... I will post tomorrow... hee hee. Yours turned out amazing! Great job Melaine, love it. And I like Savannah's room, turned out really nice. We are loving our "chocolate" bedroom too. It turned out so wonderful Melaine, loved watching the room take shape this week! That looks great and I just love her new room!!! Hi, I didn't leave a comment yesterday because there were already SO many! Well done, what a beautiful job you have made of your daughter's room. She must have fallen asleep feeling like a little princess. 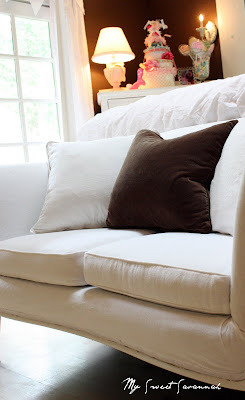 I love the shape of the little love seat, and you certainly managed to cover it well. You are a real inspiration. Martha Stewart should be getting worried! I just want to say, you are amazing. I think you do a great job in all of your projects. I wanted to let you know that I got inspired from your vintage framed chalk boards and I made some to take to my flea market. Thank you so much for sharing your wonderful ideas. The loveseat is beautiful and I bet your daughter is in candy heaven. Oh thanks for sharing how you covered that wonderful seat! You need to tell us how you made that ruffled bedskirt next!! wow, that is beautiful, you made it look easy. Oh wow, that is just beautiful! Way to go, very impressive! You did a fabulous job Melaine. That is simply fabulous! Awesome job!! I was wondering how you got the piping on the cushions? I am also assuming this is a 2 person job to get the fabric pulled super tight? 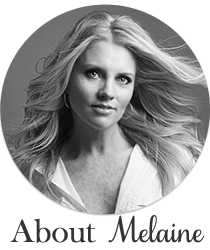 Melaine - what a beautiful transformation! Love it! Love the savings by using used curtain panels! Brilliant! That is better than a slipcover anyday. Good job on the loveseat. Love everything about the room. What a nice suprise!!!! Bravo!! Well done it's lovely! And the 35 dollar price tag ain't to shabby either! Amazing job. Looks fantastic! You should be so proud of yourself! You did a beautiful job! It looks beautiful. I wouldn't know where to start on something like this. I admire you! It's darling. I absolutely love your daughters room. The dreamy bed is fabulous. When summer arrives here in Australia I think my bed needs that makeover. The whole project is inspiring. Wow...this is stunning! I am hosting a jewelry giveaway on my blog. Would love to see you there! Love the loveseat. I never find anything like that at Goodwill!! By the way, the room is delicious! I'm considering starting a blog. I love the idea of documenting my kids' growth and family events, but was wondering if you ever worry about all the crazies out there? Ya know they might see your blog and your family pictures and just show up or, something else? I'm such a scaredy cat and worry about those things. Should I be or am I being silly? You are one talented lady. That turned out FABULOUS!!! i love it. is there a tutorial that you used? i bought a chair last week that i would like to reupholster but i don't know where to start. thanks! So beautiful and inspiring. Melaine, i must say that this is wonderful. I have recently started blogging and im much inspired by your blog! Also, could i please mention your web URL in my blog. I am in awe of your talent!!! I'm also jealous! Nice job! What a great purchase, style wise and cost. I'm impressed. Her room turned out fabulous. What a lucky girl. Has she had a sleepover in it yet?